Have you seen the “line starts here” signs when you are out and about doing your holiday shopping? The sign also has an arrow to make it crystal clear where you are expected to stand in line to wait your turn. Yet, how many times have you had it happen that either someone walks up to the cash register (bypassing the line altogether) or they come and stand next to you in line, Not BEHIND you, but NEXT to you? Is this something that’s happening all across America or is it just in my little corner of the world? After this has happened too many times to count lately, I began thinking about the whole lining up topic. I went to kindergarten a really long time ago and let me tell you, “back in the day” as they say on Pawn Stars, even kindergarteners were taught how to line up AND even walk in a straight line. When I first began teaching, the school that I was at had such high expectations about the way we lined up our students, that they put a line on the floor that ran down each side of the hallway. Students were taught to put a foot on each side of the line. I had 32 first graders, yet I somehow managed to teach those 6 years how to line up and walk in a straight line. Why is this such a difficult concept for adults at a mall when the store has given such clear directions? Are teachers no longer expecting students to line up and walk in a line? Here are a few tips I thought I’d pass along. I would love to hear your ideas, too. You can add a little math when you line up your students if you tape numbers on the floor. This shows students where they are going to stand. Add a seasonal touch by changing the numbers each season. In the fall use orange / yellow, in the winter use red / green, in the spring use pink / red, and at the end of the year use orange / green. Sometimes I use one color for each number. Example: in December all of the odd numbers would be red and all of the even numbers would be green. When lining up ask students with an odd number to line up first. Your students will quickly learn odd and even numbers. Another example: in February, make all of the numbers in the ones place red and all the numbers in the tens place pink. 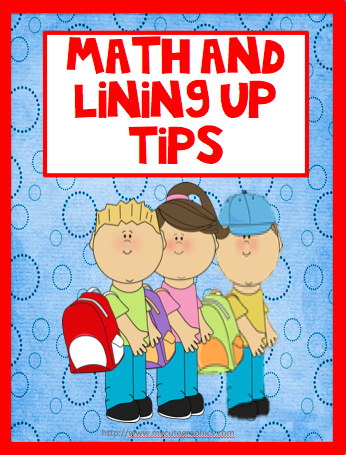 When lining up you can give different problems like: *If your number has an odd number in the tens place, you may line up. *If your number in the ones place is equal to 3 + 4, you may line up. Your students will quickly become mental math wizards! Click on the picture below to find some great freebies. I do ABC order. Seriously changed my life as it eliminated all of the "he shortcutted me!!!" Drove me crazy!!! Last year I had an equal number of boys and girls, so I did boy/girl order. The star got to begin the line so that determined whether we started with a boy or girl. This year I have only 7 girls, so we do 2 boys/girl order. I don't have to say anything. They just get themselves ordered. If any girls are missing, there are a few extra boys at the end, but the boys want to be at the front, so this isn't usually an issue. Love this idea! This is my first year in first grade, and I've never had so much tension about the line. I thought I'd tried everything, but I love this! Thanks for sharing!! I like to call out addition or subtraction problems when lining up. The first student to answer correctly gets to line up along with the friends who sit at his/her table. I continue calling out problems until all tables have lined up. The kids love it!